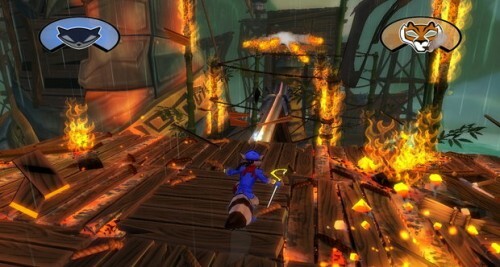 The latest video game franchise to get a chance to go to Hollywood is animal platformer, Sly Cooper, and its movie has just received a brand new trailer. You’ve probably heard it over and over again, the notion that movie and game tie-ins are absolutely rubbish. Generally, that suggestion is made when movies get downsized and get the code and mini-game treatment, but it often goes the other way too. Resident Evil, for all of its box office success, is hardly a critical darling, being criticised for trading scares for action in a way that the game series it’s based off never did. Need for Speed, the EA racing sim, is also set to make the Hollywood jump and looks every bit as high octane as the games, though overall, tie-ins are very hit and miss. It’s a high stakes game then, for Sucker Punch and Sony, who are bringing thieving animal caper, Sly Cooper, to the big screen. While the trailer above suggests enough about the game, in text, the film reads quite well, likely set to entertain out-of-the-know moviegoers and series’ fans alike when it hits cinema screens. The film is being officially described as a “kinetic and comedic heist” as the titular Sly uncovers the secrets of his birth family (Sly is an orphan) and that he actually shares a lineage with a talented family of thieves. This of course leads our main guy on a “global adventure”. It’s not all genealogy and thievery, however as an “evil Russian metallic owl” named Clockwerk (not a typo) aims to put an end to Sly’s adventuring, and indeed, his family’s bloodline. Sly Cooper also won’t be street lamps and shadows either as the film will take viewers “From romantic Parisian backdrops to the lush mountains of China, gritty film noir meets bright, colourful graphic novels in this origin story of the world’s greatest thief-turned-hero.” So it sounds promising then, but we won’t know completely how the film is shaping up until its release in 2016.